I want to do a simulation where I have a custom conveyor that moves like the example video does. How is this possible? I have the conveyor python program but I don't know how to link the program and the conveyor and get it to run. Any help is appreciated. Using a Python program: With a python program you can define the work area to automatically grab the parts. You can also better customize the movement behavior and specific events (for example, when the part reaches the end of the conveyor ant it has not been taken by a robot). Using a Mechanism: You can build your own mechanism using the menu "Utilities"-->"Add Mechanism or Robot" and model the conveyor as one linear axis. See image attached. 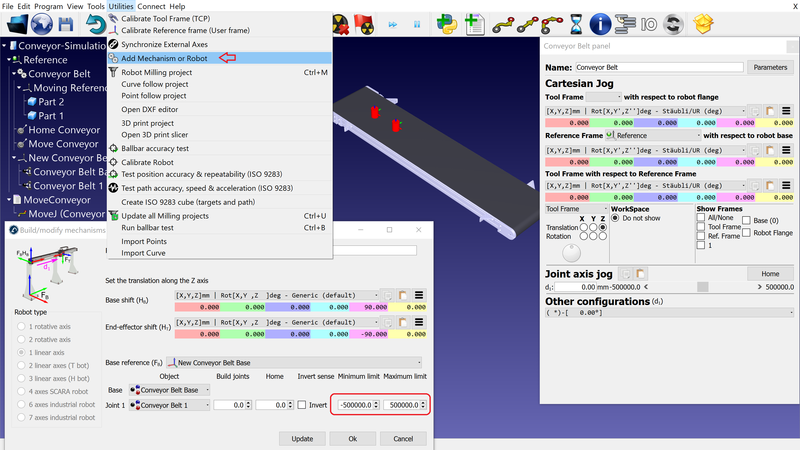 You can then create a Home position with the linear joint of the conveyor at 0 degrees. See image attached. and select "Type"-->"Object" you can also download it from there.